Amazon today became only the second US company in history to touch a market capitalization of $1 trillion. Amazon’s $1 trillion (Rs. 70 lakh crore) milestone came a month after Apple had touched the same valuation, but Amazon is a much younger company than Apple. Apple had been founded all the way back in 1976, while Amazon was founded in 1994. And back then, Amazon founder Jeff Bezos had an office that was much like the office of any young startup looking to make its mark. Jeff Bezos had quit his lucrative job at Wall Street in 1994 and driven across the country to Seattle, where he’d quickly set up a small setup using a loan from his parents. 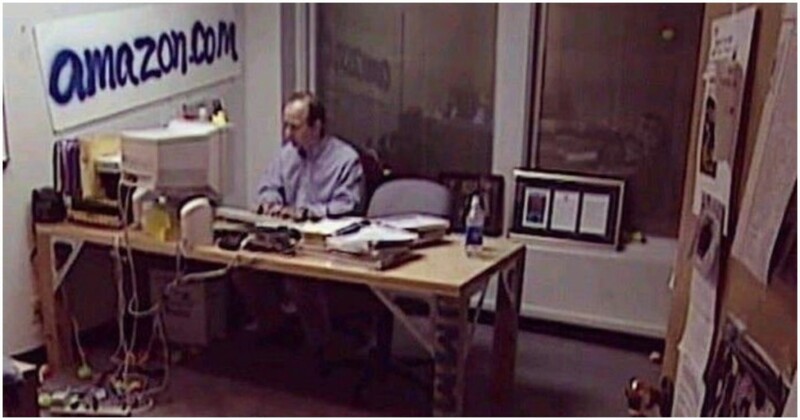 In pictures of the office from the time, Bezos is seen sitting at a large wooden desk with “amazon.com” written on the wall next to him in what looks like blue spray paint. Bezos has a clunky old CRT monitor in front of him, and a jumble of cables are haphazardly connected to an extension cord. Amazon’s first office was much like any startup office. It was run out of the converted garage of a rented home, and extension cords ran everywhere because there weren’t enough electrical outlets to power the servers that Amazon used. Wired described the space as “cramped” and “poorly insulated”, with a stove that sat in the middle of the room. The stove was eventually removed and replaced with heaters, which along with all the extension cords, overburdened the power supply. And Bezos’ now-famous frugality was visible even in Amazon’s early days. When Amazon’s handful of early employees needed desks, he found a cheap solution — he hacked them together on his own, using a door as the desktop and four-by-fours as legs. “We happened to be across the street from a Home Depot,” said Nico Lovejoy, who was Amazon’s fifth employee. “[Bezos] looked at desks for sale and looked at doors for sale, and the doors were a lot cheaper, so he decided to buy a door and put some legs on it.” Bezos’s desk in the picture above is unnaturally long not because he wanted a lot of room to keep his stuff, but because it is really a door. Things sure have changed since then. What began as a scrappy young startup looking to save money on desks is now the second most valuable company in the world. Bezos himself is worth $166 billion, and has become the richest man in modern history. From building his own desks to having built the greatest e-commerce company in history, Bezos sure has come a long way.